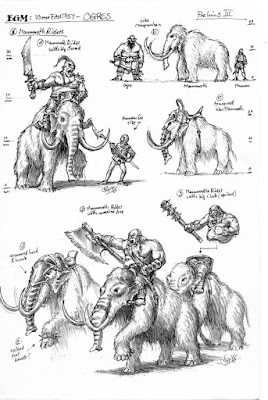 We are halfway through Black gate Miniatures first Kickstarter and I am delighted to be able to show off the concept art for the Mammoth Riders. Created by that talented chap Christian Schwager, these guys are going to own the battlefield. We now have the art for the first four unit types, which would provide a very decent, playable Ogre army. So tell your friends, tell your gaming groups, share on Facebook, Twitter and forums all over the world and let's make it happen. Finally, with the £ continuing to slide against both the Euro and $, it is a great time to be buying from the UK, no matter where you are based in the world.